We're all very sad that Graydon Carter is ending his 25-year run as editor of Vanity Fair. His uncanny ability to suss out the most entertaining, sometimes scandalous and always interesting stories in art and entertainment kept us all in thrall, and his impeccable taste level will surely be missed. Goodreads celebrated its 10th birthday! We don't know how we ever lived without it! We talked to author Adam Sternbergh and Ecco Books Associate Art Director Sara Wood about how an author and book cover designer work together. Subscribe to our YouTube Channel while you're there! This week our staff exceeded our fundraising goal for the Book Industry Charitable Foundation to provide relief to bookstores and booksellers affected by Hurricane Harvey. Join us in supporting those on the front lines of supporting books and literacy! 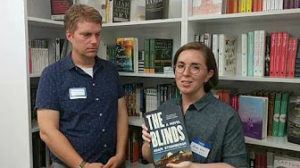 Conservative publisher Regnery Publishing announced that they were cutting ties with the New York Times Book Review over allegations that the paper's liberal bias is keeping their books off the list.